Previous studies have shown that obese children are more likely to develop asthma. 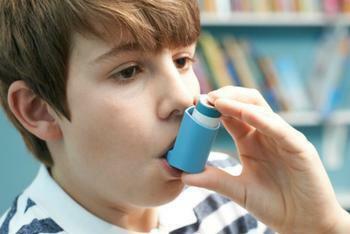 Now, a new study suggests that kids with asthma are at a greater risk of obesity. The association was revealed following an analysis of the health records of nearly 2,200 elementary school students in California. Investigators found that childhood asthma was linked to a 51% increased risk of obesity over the next decade. The researchers also found that the use of “rescue” inhalers reduced the risk of becoming obese by 43%. “Asthma and obesity often occur together in children, but it is unclear whether children with asthma are at higher risk for onset of obesity or whether obese children develop asthma, or both,” said lead author Zhanghua Chen, a postdoctoral research associate of preventive medicine at the Keck School of Medicine at the University of Southern California. “Our findings add to the literature that early-life asthma history may lead to increased risk of childhood obesity,” Chen said in a statement. While the new study did not prove a cause-and-effect relationship between asthma and obesity, the authors say it did suggest a connection worthy of further investigation. The fact that rescue, but not controller, asthma medication appeared to reduce the risk of obesity was surprising, said senior author Dr. Frank Gilliland, a professor of preventive medicine at the University of Southern California's Keck School of Medicine in Los Angeles. The link might exist, Gilliland suggested, because kids with asthma play outside less often when their symptoms flare up. Additionally, “sleep disturbances are common in asthma, and a large risk factor for obesity," he said. To reduce the risk of obesity, the authors say children with asthma can use simple but effective strategies for improving their overall health. Strategies include eating a healthy diet and increasing physical activity, as well as knowing triggers and maintaining control of the chronic respiratory condition through medication. The full study has been published in the American Journal of Respiratory and Critical Care Medicine.